The exhaust plume of a shuttle launch that created noctilucent clouds similar to those seen after the Tunguska event supports the theory that a comet, and not a meteoroid, exploded over Siberia one hundred years ago. “It’s almost like putting together a 100-year-old murder mystery,” says Cornell University’s Michael Kelley, who led the research. Following the event at Tunguska, and various shuttle launches, brilliant, night-visible clouds, or noctilucent clouds were observed. Noctilucent clouds, or NLCs for short, are high altitude thin sheets of clouds that reflect sunlight when the Sun is between six and sixteen degrees below the horizon. The shuttle's launch exhaust creates a dazzling view over the Vehicle Assembly Building an hour after liftoff. Image: Ben Cooper/Spaceflight Now. After the June 1908 explosion the night skies shone brightly for many days, notably in the UK, almost 5,000 kilometres away. Recent interpretations suggest these “glowing skies” were the result of NLCs. 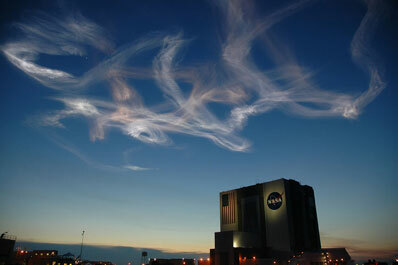 The same NLC phenomenon was also observed after space shuttle launches in 1997, 2003 and 2007. A single space shuttle flight injects 300 metric tons of water vapor into the Earth’s upper atmosphere, and the water particles have been found to travel to the Arctic and Antarctic regions, where they form clouds after settling at lower altitudes. According to Kelley and colleagues, the shuttle exhaust plume resembled the same action as a comet breaking up and depositing vast amounts of water vapor into the atmosphere. They contend that the Tunguska comet would have started to break up at about the same altitude as the release of the exhaust plume from the space shuttle following launch. Just as the water particles from the shuttle found themselves in the polar regions, the cometary ice would have been swept up in eddies in the atmosphere and transported thousands of kilometres around the globe. 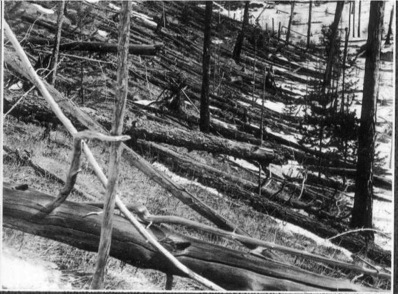 Felled trees as seen by one of the first expeditions to the Tunguska blast area. Image: University of Bologna, http://www-th.bo.infn.it/tunguska/. counter-rotating eddies with extreme energy that distributes the water around the globe extremely rapidly. “Our observations show that current understanding of the mesosphere-lower thermosphere region is quite poor,” says co-author Charlie Seyler. The Earth's atmosphere is split into layers, with the troposphere extending from the surface, followed by the stratosphere, mesosphere, thermosphere and exosphere. The International Space Station orbits in the thermosphere at an altitude of around 350 kilometres. Scientists have long argued the composition of the Tunguska impactor, falling into the two main camps of asteroid or comet. Either way, the explosion of the body was enough to flatten some two thousand square kilometres of forest and provide one hundred years worth of study and speculation. The Cornell University researchers will present their research in the Geophysical Research Letters journal.